On Friday 3rd March, 9 Ysgol Treffynnon students took part in a drama workshop at Theatre Clwyd, Mold. This is a nationally recognised drama workshop which deals with issues that can affect young people in their daily lives, especially social media. The workshop looks at the causes and consequences of breaking the law from both sides of the justice system and all parties involved. Students interacted with the drama production, wrote scripts for actors and had a say in the outcome of the case. 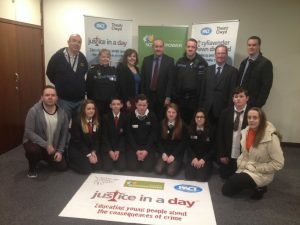 They also visited Mold Magistrates Court and had the opportunity to ask a real magistrate questions and see the day to day workings of a court. The students who took part were excellent and interacted extremely well.